"Saturday Night Live" took us to a world without Donald Trump as president in a send-up of the classic Christmas film "It's a Wonderful Life." The show started with the classic black-and-white open and Trump on the balcony of the White House. 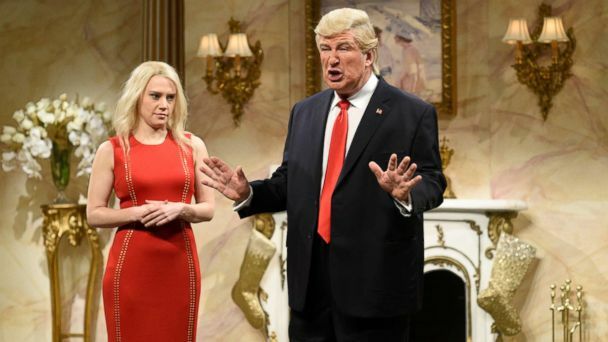 "I don't think I can do this anymore," Alec Baldwin, making another cameo as Trump, said. "It's awful, everything's falling apart, sometimes I wish I was never president." Kenan Thompson appeared beside him to take him to a party and show him just that reality. "Everyone looks so different, what are those things on their faces?" Trump asked. "Those are called smiles, Mr. Trump," Thompson replied. First he is visited by Sarah Sanders, played by Aidy Bryant, who is not his press secretary and instead making a ton of money working in public relations -- including representing the romaine lettuce industry. Then he is visited by Kellyanne Conway, who Trump says looks great. "Actually that's because I'm no longer eaten inside by lies," she responds. She is also getting along with her husband. It's at this point that Trump realizes Hillary Clinton must be president. "Did they find her emails?" Trump asked. "Yes, they did," Thompson deadpanned. "They were all Bed, Bath and Beyond coupons." Melania Trump shows up, sans accent, and now married to Papa John. Meanwhile, Trump's new wife, Hernia, also makes an appearance. A thrilled Michael Cohen, played by Ben Stiller as always, shows up, no longer facing years in prison. "I would never flip on you, you're my best friend," Cohen said. "Since it's Christmas, I just want to say you taught me everything I know ... like O.J. [Simpson] and Kato [Kaelin] or Lyle and Eric Menendez. "I'll see you tomorrow at the opening of Trump Tower Moscow," Cohen gleefully blurts out before exiting. Brett Kavanaugh makes an appearance -- played by the week's host Matt Damon -- to say he's not on the Supreme Court: "Me on the Supreme Court? With my temper?" "This is all so great, it's like Robert Mueller doesn't exist!" Trump exclaims. "Oh really?" Robert De Niro, returning as Mueller, said. "Hello Mr. Trump, I've been waiting for this moment for a long time." Mueller hands him a paper, only to find out it's a photo of his grandson and not a subpoena. Trump doesn't take the hint -- all of the hints -- though, and he believes he should be president. "I guess the world does need me to be president!" he said. "Yeah, that was not the lesson at all," Thompson said. But it's too late, and we're plunged back into a world with Trump as president before the whole party tells us, "Live from New York, it's Saturday night."